AI: You discovered electronic instruments at a time when the medium was young. What electronic musicians in the 70's were you listening to/influenced you? TG: The earliest I guess was Wendy Carlos' (Walter at that time) "Switched on Bach". Then probably Tomita, Klaus Schulze, Tangerine Dream, K. Leimer, Robert Shroeder and Kraftwerk. I was also influenced by Beethoven and Bach early on... my first electronic compositions were freeform, and remaking Bach pieces electronically. I was also influenced by the academic world of electronic music... attending several recitals at universities and having a music teacher who was a professor of electronic music. My father also brought home a theremin and a random electronic tonal chord generator and I was absolutely entranced with these devices. This was probably around 1971 or 72. AI: You built a synthesizer at 14. Was this considered an oddity when you used it at school? TG: I started playing in our high school jazz band when I was in junior high. I was one of a very few guitar players in my community. I had my grandfather's 1963 hollowbody Richenbacher and primarily played that, but I also used my own synthesizer which was a hybrid of PAIA and some circuits I gathered from magazines. My father taught electronics at that time and the home environment was such that I could build it. The serious trouble-shooting was handled by dad. Of course, the tuning of the thing was pretty unstable and my use of it in jazz band and live performance consisted mainly of special efx. There were a few other jazz bands that incorporated synth. Most of these had the "CAT OCTAVE" or a "MINI MOOG". Usually they were from larger schools or more wealthy communities. I would have had one, but their price range was out of my reach so I had to build one. AI: Tell me about the Space for Music shows you were involved with in the 80's, and apparently continue now. TG: I was inspired to create a venue for performance of electronic music because there were several other electronic music composer's in this community. (Jack Tamul, Gil Trythal, Giles Reaves, Gerrit Wilson, William Linton, Kirby Shelstad, Robin Crow, Martin O'Connor, and Allen Green.) I had also started collaborating with Don Evan's at Vanderbilt University in the early 80's. Don is well known for his multimedia work in the 60's and continues to this day. He has a huge collection of esoteric electronic music recordings and is a great supporter of electronic music. He had been using emusic composers with his performances since the 60's and it was a natural for me to start working with him. Thus I was introduced to multimedia performance in conjunction with emusic. Inspired by this and the fact that I was continually coming in contact with other composers in the Nashville community who seemed to have similar visions, I drummed some grant monies to start the first "Space for Music" show performed at the University Theatre on Middle Tennessee State Campus in 1986. There were probably 35 people involved with pulling off the show. This was a chance for all of us into the emusic to perform. It was a big hit...There were a couple more shows at festivals. They were lots of work, people working for nothing and still an expense to pull off. I joined forces with Aashid Himons to create the "Mind Orbit" shows of the 90's. They were very similar and involved many of the same people. It was just now Aashid was producing and I could concentrate more on my music. AI: The acoustic Nappanees is a far cry from Spacecraft. How do you happen to find yourself in such diverse musical projects? Any particular personal needs that are met by these varying projects? Is electronic music your primary interest? TG: One, I started my music career on acoustic guitar, my mother is from the mountains of Tennessee and I was surrounded by mountain and gospel music growing up. I even played in many of the churches as a youngster. So acoustic string music is in my blood. It comes from my mother's side. My father is Swiss, and my electronic music and computer fascination comes from that side. Two, the grounding effect of acoustic contrasted to electronic provides a balance which is very important. Three, I also sing and it is a chance to keep my voice up. Four, the Nappanees and playing with the Mountain Soul Band is Y2K compliant. AI: I see where you introduced guitar on Hummel whereas you just played synths on the first Spacecraft. 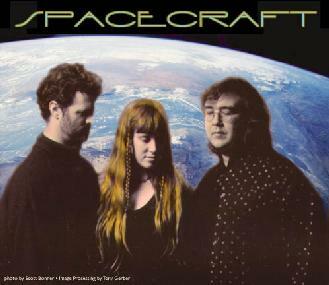 Any thoughts to incorporating the guitar, or other non-synth instrumentation, even more into Spacecraft? TG: Yes. Most definitely. In fact, I just had a mandocello built by Bardsong Instruments which is set up to plug in. I am looking forward to incorporating this acoustic string instrument into the Spacecraft stuff. Especially since the luthier put a plaque on the inside of the mandocello that says "For Spacemusic". So I guess I have to live up to it. John Rose has recently built a long string electric sustaining instrument, inspired by Chris Blazen's participation in the debut "Spacecraft" album. He used it in the last planetarium show and Diane Timmons uses voice and sometimes flutes. Occasionally a drum or so is incorporated. I don't think spacemusic is dependent on only synthesizers. It is in the execution and musical space created by the performers. AI: The first Spacecraft release was inspired by sound files of the Voyager spacecraft downloaded from the NASA website, and Hummel was a live performance at the Hummel Planetarium. Is there anything specific that inspired the upcoming Spacecraft release, Earthtime Tapestry? TG: I think the main inspiration comes from the interconnected matrix of all living things. As the years pass by, the more I realize what a delicate tapestry the earth experience is. Sitting at the end of the 20th century, I think it is important to reflect on this reality. As Albert Schweitzer says, "Reverence for Life". We hope the music on "Earthtime Tapestry" provides that healing quality of oneness. AI: Your deep involvement in multi-media has me wondering what the Hummel show was like visually. Was it anything elaborate or was the focus purely on the music? TG: We have treated the visuals, much like the music. Each of our performances are mostly improvisational in nature. Jack Fletcher and Cory Anderson of the Hummel Planetarium are very into "improvising" on visuals along with us. This is an experience they don't get to do that often because most of the planetarium shows are preprogrammed and purchased from a catalog. We hope this is the process at future planetariums also. It keeps it fresh. The Hummel show utilized mostly laser efx, which is a fairly elaborate and state of the art system. Sometimes I take video along to use, and sometimes they just pull tricks out their hat. AI: In the Performances listing on your web page several of them are listed as "multi-media". Are these musical multi-media performances, or something else? TG: When I list a show as multimedia, it incorporates video, film, slides, set design, dance and special effects along with the music. I have found that many times people in the audience are not sure how to listen to only the spacemusic. They need visuals to accompany them if they are not that experienced with inner travels. It also provides a great vehicle to get together with other friends into this type of performance. AI: Being just as involved in the visual arts as you are music, is the music you do with Spacecraft at all times visual to you? That is, is some imagery usually in mind when creating Spacecraft's music? TG: Of course, sometimes there is imagery or ideas before hand, or sometimes the images happen after the music is recorded. It works both ways. As John Rose says, "We create soundtracks for life". AI: Is a Spacecraft performance in a planetarium, or outdoors under the stars much more enhanced than in a traditional concert hall? Any notable differences in audience response? TG: There is a big difference between outdoors and indoors. The energy of being out in nature, with a natural canopy of stars is invigorating. The music can get real intense when we are outside. The planetariums of course, have a unique ambience inside of a dome building which provides a very artificial, or simulated type of situation. I think the music is effected by these differences. The audience is much like a regular concert hall performance, except, sometimes the music might be continual for 30 minutes or more and the audience may not applaud until the very end, which is fine. I am sure we will be performing in other venues than just planetariums this year. In fact, in Philadelphia for the "Stars End Gathering" we perform in St. Mary's Church. Each environment and audience provides a different "vibe" about the music. AI: You're involved in the traditional arts (painting and "regular" instruments), and the technological arts (computer art and electronic music). Do the two peacefully coexist or do they complement one another? Is technological art a threat to the traditional arts? TG: They most definitely complement one another. Again, it all about balance. If you stay in touch with the organic side of life and technological side I don't think technology is a threat. If we forget about the natural ways and rely only on technology, then I think it is a threat to life on the planet. AI: Any news or future events you'd like to pass on to our readers? TG: Well, we are working very hard to put together a tour for the US this year and a tour of Europe and possibly other countries next year...I am also involved with a big Peace event here in Nashville called Symposium 2000 which will happen in October of 2000. I am excited about the possibilities related to this event. It has been over 4 years since my last solo album and I am really going to try and get "Altamira", my next solo project, out this year. People can look to my website for info, tours, and updates on my activities at http://spaceformusic.com/.